Beyoncé made music history this past Friday when she dropped her self-titled fifth album with literally one word: “Surprise!” And this word was not uttered via the usual channels musicians have used for releasing albums. She posted it. Herself. On Instagram. While her previous album, 4, sold an impressive 310,000 copies in its first week, Beyoncé has sold more than 430,000 units—in one day. Here’s my one word: Amazing! While Queen B is on track to have her best release week ever, perhaps more importantly, she is solidifying herself as a music legend, not only for her talent and music, but for her business sense, too. One can only hope to be a fraction as cool as Beyoncé, but there are several lessons here you and I, as content marketers, should take into consideration. Check out how Beyoncé schooled us all. Embracing the Element of Surprise: No one knew her album was coming. As in no one. Even those “in the know.” It seems as though, in our fury to get out lots of content, we forgot to do anything out of the ordinary. We have become something we hate: predictable. Ick! Let’s take a cue from B and try to work some magic into our content. Making Her Own Rules: She didn’t release her album the old boring way. She did it how she wanted to. Just because other brands are doing something, doesn’t mean you have to. Figure out what works best for you and your brand, and then do it! Ignore anyone who tells you it must be done the same boring way. Being Creative and Not Apologizing: The Beyoncé album includes 14 new tracks and an unprecedented 17 music videos. This groundbreaking visual approach to her content frankly put other artists to shame. Why not give our buyers more than they expect and do it beautifully? It is sort of our job as content strategists, right? Getting Personal. Like Really Personal: In one of her few official statements, Beyoncé said she wanted to the album to “come out when it's ready and from me to my fans." This was her gift to her fans, from her. Removing the middle men from the process, Beyoncé created a bond not always available between celebrities and us mere mortals. Pretty personal and, chances are, this made her fans love her even more. Plus, the last song on Beyoncé features the singer’s young daughter, Blue Ivy. What’s more personal than that? As marketers, our content is nearly required to get personal. Don’t be afraid of this; Beyoncé sure wasn’t! Relying on Old Methods: When I said official statement, I meant it. 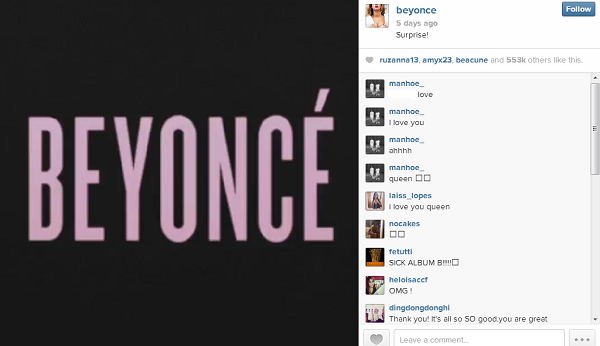 Master of creativity and modern content, the Queen B still chose to send out a press release. A press release! Even after all the hubbub from Google! Imagine that. But in a smart move, Beyoncé used it as the definitive answer to all the questions floating around the Internet. So whether it is direct mail, press releases or another “old-school” tactic, if it works for you, go for it! While we may not always have all the resources at our disposal that Beyoncé does, look at what she utilized during this stunt: videos, Instagram, a press release and her brain. It doesn’t take much to rule—just a little creativity and rule breaking. That's why we love you, B! What content marketing lessons have you learned from your favorite celebrities? Share your thoughts in the comments! 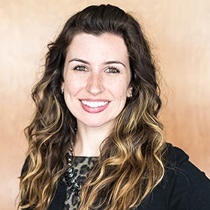 Brianne Carlon Rush is Content Director at Kuno Creative. She uses her content marketing powers to help Kuno and its clients build their brands. You can connect with her on Twitter, LinkedIn and Google.